Add mystery and excitement to your performance with this beautiful silk veil made specifically for belly dancing. Standard size 3 yard rectangle with hemmed edges - approx. 108" x 40". *Please note that rainbow colors may vary slightly from photo. *Please note that exact color shades may vary slightly from photo. 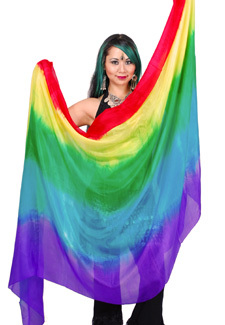 This veil has vibrant colors and moves so beautifully. Love it! Q: Are the colors:red, orange, yellow, green,blue,purple and do they blend into each other like tye died? Thank you for your question. The colors blend exactly as they appear in the photo. However, in our current inventory, the purple color appears more of a royal blue. Q: Does this veil include orange? It's hard to tell because it's folded in the picture. A: Hi Dancy, Thank you for your question. The colors in this beautiful rainbow veil are red, yellow, green, blue and purple. I hope this helps.